Photography Blog has tested the Olympus E-600 DSLR camera. This DSLR from Olympus feature 12.3 megapixels in a small camera body. Let us hear what the reviewer thinks about the latest Four Thirds format camera made by Olympus. 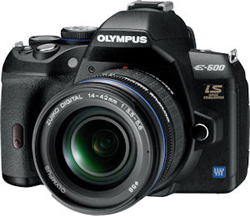 Photography Blog ens up giving the Olympus E-600 a “Highly Recommended” 4.5 out of 5 stars rating. The camera scores highest on value, image quality and design while scoring a bit lower on features and ease of use. The E-600 seems to be almost as good as its bigger brother, the Olympus E-620, but lacks a few features that give the camera a lower price tag. Overall the E-600 seems like a very nice budget DSLR. Read the full review of the Olympus E-600 camera here.